Samoa unearthed great rugby talent in 2016. Almost every international match, Samoa blood new players always looking for new talent to unleash. 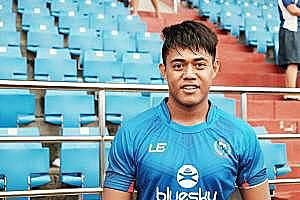 And Samoa has succeeded in nurturing and harnessing several young talented rugby players who received their first international debut with Samoa and have gone on to make remarkable feats for their team and country. Now no longer debutants, these players are definitely people to look out for in 2017. Gordon Langkilde (Samoa) : The 20 Year Old starred in the U-20’s National team and has climbed his way up the ranks. Langkilde featured in the Oceania Seven’s team that faired well in the tournament. He reached the pinnacle his career by being named as one of the 13 players heading to Dubai and Cape Town for the HSBC World Series. He officially made the starting line-up in the third match against Russia in Dubai and has been a permanent fixture in the starting forward pack since then. D’Angelo Leuila(Southland NZ) : Leuila has recently been dubbed “Breakout Star of the Year” for the Manu Samoa. Leuila has a tremendous year in blue, with his first cap in the Georgia test match in June. But this star burned brightest in the Northern Hemisphere Tour in the final match against Canada. It was by Leuila’s golden boot that sunk the Canada team. At only 19 years of age, Leuila is definitely someone to look out for in 2017. Malu Falaniko (Samoa): Falaniko was a staple in the U20’s team’s having appeared in both the 2015 and 2016 teams. He then started the Pacific Nations Cup against Fiji and Tonga. Falaniko received his first cap in the Georgia test match alongside Leuila. These young stars proved they had the tenacity to play alongside their much more experienced brothers and Falaniko was later named to the Samoa A team that journey to the Americas Pacific Challenge. What makes Falaniko standout with his unique ability to transfer over from the 15’s game to 7’s with ease. He was later picked to travel to Fiji for Oceania where he made numerous game winning tries. We’re sure we haven’t seen the last of the 21 year old star. Chris Vui (North Harbour- NZ): The 23 year old forward debuted with the Manu Samoa in the Northern Hemisphere Tour in November. The powerful lock is a former New Zealand under-20 forward, he played for the North Harbour Rugby Club and even represented the Blues in Super Rugby. His performance with the Manu caught the eye of Carl Hogg who is the Head Coach of the Worcester Warriors. He officially signed to the Warriors in early December and is projected to be a great asset to the forward pack.